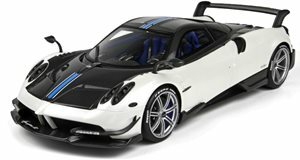 The Pagani Huayra BC features a 6.0-liter twin-turbo V12 with 750 hp and 811 lb-ft of torque, a revised 7-speed single-clutch gearbox powers the rear wheels through an electronic differential and the lighter bodyshell and suspension updates make for an even more powerful and impressive performer. Active aerodynamics, a full titanium exhaust and a Carbo-titanium weave construction method are some of the exotic features of this beautifully styled sports coupe. 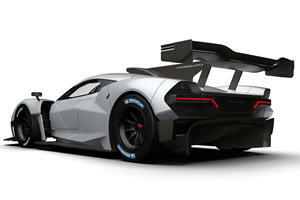 A limited production run of 20 examples help ensure its exclusivity. Few people who experienced the original Huayra back in 2012 complained that it was lacking in power or handling ability yet the shadow of the characterful Zonda loomed large over its achievements and some customers wanted something even more outrageous. Enter the Pagani Huayra BC in 2016, a car named after the very first Pagani Zonda owner Benny Caiola, it featured more power, less weight and updates aimed at improving its handling potential. A mere 20 have been slated for production (all have been spoken for) and it remains the ultimate version of an already hugely impressive sports car. The interior of the Huayra BC is still an exquisitely detailed mix of high-quality materials and bespoke design elements although much has been pared down in the pursuit of lightness. The beautiful exposed gearchange linkage still takes pride of place between the driver and passenger and the gullwing doors offer easy access to the interior. Each car has been customized to the specific requirements of each owner giving an even more bespoke feel to this sports coupe. The normal Huayra can be a handful on the limit and the BC has had a number of detail changes carried out to the suspension settings to give it a more controllable feel during hard cornering. The weight saving measures mean that curb weight is under 2700 pounds which is extremely light for such a powerful car and it is distributed 48/52% front/rear so the car pivots around its center-point. The steering is reassuringly heavy yet accurate and although the revised fully-adjustable dampers give the BC a stiffer ride, it still offers acceptable bump absorption on the road but a more progressive breakaway at the limit. Each BC also comes standard with bespoke Pirelli road tires as well as a set of track-based rubber and the driver selectable traction control system gets an additional track mode to complement the comfort and sport settings. The calipers and brake discs have been updated and offer fade-free performance to go with the increased accelerative capabilities. Active aerodynamics offer additional downforce at speed and the various flaps can be seen working as the car changes its speed or negotiates a bend, in all the result of all these changes make this 750hp+ coupe behave in a very accessible and flowing manner. The Huayra BC features a development of the ‘standard’ Huayra AMG powerplant and the 6.0-liter twin-turbo V12 is now pushing out 750 horsepower and 811 lb-ft of torque. A 7-speed single-clutch gearbox powers the rear wheels and changes are now twice as quick as before, while some dual-clutch units may be even quicker, this setup is still rapid and weighs less overall. A newly developed electronic differential helps put the power down more effectively yielding an estimated 0-60 mph time of 2.3-seconds and the BC really gets going as the speeds rise, the quarter mile sprint takes well under 10-seconds. A new (lighter) titanium exhaust system adds some more aural drama to the proceedings and while the Huayra BC is undoubtedly quicker than the old naturally aspirated 7.3-liter Zonda, the sound it delivers is less characterful. The shell of the Huayra BC is composed of a new Carbo-titanium weave that lowers weight while offering incredible structural rigidity, an updated titanium exhaust system, more powerful brakes, uprated engine and adjustable dampers are some of the changes over the standard Huayra. Each Huayra BC also comes equipped with a set of staggered 20/21-inch road tires as well as 19/20-inch wheels with track-based tires and a new track mode for the traction control system allows more liberties without having to turn the system completely off. 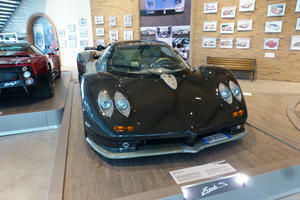 Horacio Pagani built a name for himself with the establishment-rocking Zonda, a characterful supercar with otherworldly performance. 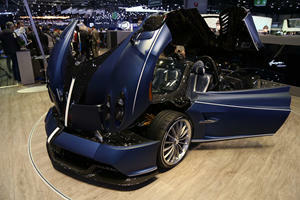 The Huayra BC stays true to this formula and adds another layer of performance and dynamic ability into the mix. The additional power over the standard Huayra is matched by even more accessible handling thanks to numerous detail updates. The approximately 20 units have long been sold but there is hope yet in the shape of an open-topped version that may be going into production in the near future.